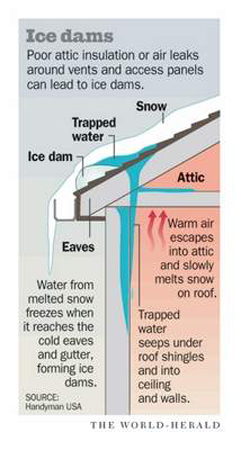 An ice dam occurs when warm air escapes into the attic and slowly melts snow on the roof. The water reaches the cold eaves and gutters where it re-freezes, builds up, and forms an ice dam. The water eventually becomes trapped and often seeps under roof shingles and into ceilings and walls. One of the most common areas for this to take place is underneath the first course of shingles. Leafproof® helps to reduce ice dams in this problem area because it installs underneath the first row of shingles. This prevents snow and ice from forming in the gutter and working its way up underneath the first layer of shingles. Other gutter covers that are not installed underneath the shingles can actually INCREASE ice dam formations. These products leave the roof edge exposed. Ice will collect in this area and can cause damage to the roof edge, soffit, and fascia. 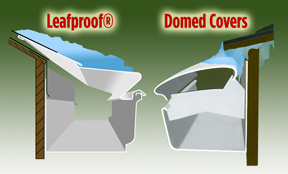 When selecting a gutter protection system, choose Leafproof® and enjoy the benefits of all season performance?